The Quad Cities River Bandits, Class-A Affiliate of the Houston Astros, have announced that their upcoming home series, scheduled for April 18-20 against the Kane County Cougars, will be moved to Peoria's Dozer Park due to lack of access to Modern Woodmen Park. 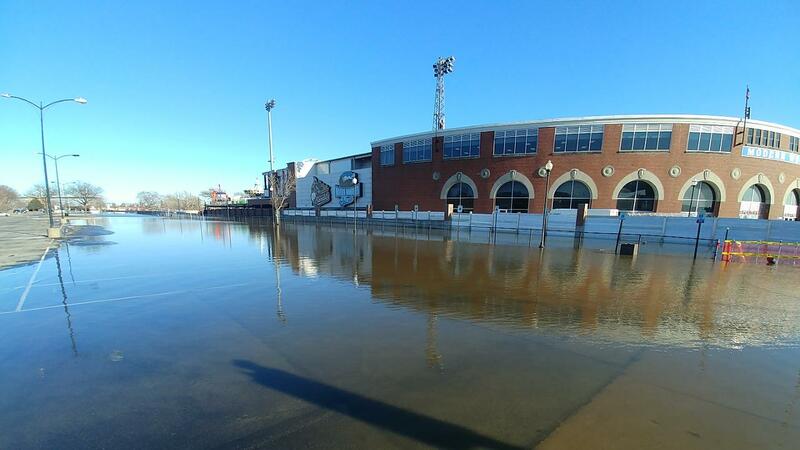 The ballpark remains unaffected by the flood waters, but the continued operation of Canadian Pacific trains make it impossible to move players, staff, fans and equipment in and out of the ballpark safely, without exposure to the surrounding flood waters. This means that the entire six-game homestand from April 15-20 has been moved out of the city. The River Bandits announced on Tuesday that the first three games of the homestand were relocated to Cedar Rapids April 15-17. Both the City of Davenport and the team remain hopeful that the River Bandits' remaining home games, starting April 25-28 against Clinton at Modern Woodmen Park, can be safely played. The games on Thursday, April 18 and Friday, April 19 will begin at 6:35 p.m. The contest on Saturday, April 20 features a 1:15 p.m. first pitch. The River Bandits will serve as the home team for the entirety of the series. Tickets for all three games at Dozer Park will cost $5 at the gate, with all of the funds going to the Peoria Chiefs. River Bandits season tickets and single-game tickets for those dates will be accepted in Peoria. Fans must have those tickets in hand at the gate to gain entry. For those who cannot make the trip, single-game tickets for April 18-20 can be exchanged for a ticket to a remaining home game during the 2019 season pending availability. The River Bandits open a three-game road series against Wisconsin on Friday night at Miller Park in Milwaukee. First pitch is set for 7:05 p.m. The final two games of the series will be played in Appleton on Saturday and Sunday. ABOUT THE BANDITS: The 2019 season marks the River Bandits' seventh year as the Class-A affiliate of the Houston Astros and the twelfth anniversary season of regaining the River Bandits moniker, which was voted a top-8 nickname in all of Minor League Baseball in 2015. The River Bandits anchor the Quad Cities sports market, which The Sports Business Journal in their latest rankings named one of the top two minor league sports market in the country. Each year the River Bandits donate three annual all-tuition-paid college scholarships, a value of approximately $85,000, as part of the Bandit Scholars Program, which has been in place since 2009. Charitable contributions surpassed $600,000 in 2018, including a $100,000 cash donation to Genesis Health Systems; in 2015 and again in 2017, Ballpark Digest awarded the Bandits its "Best Charity Campaign" of the year, making the River Bandits the only team to win that coveted award twice. For more information on the Quad Cities River Bandits, visit www.riverbandits.com or contact Jason Kempf at (563) 324-3000 or on his cell at (920) 960-6919.